Create brand new Link Summoning combinations with Yu-Gi-Oh! TRADING CARD GAME Structure Deck: Powercode Link! This Deck features a new “Code Talker” Link Monster plus LINK-2 and LINK-3 monsters you can Summon using any monsters, and whose Link Arrows all point to your own Main Monster Zones! Yu-Gi-Oh! 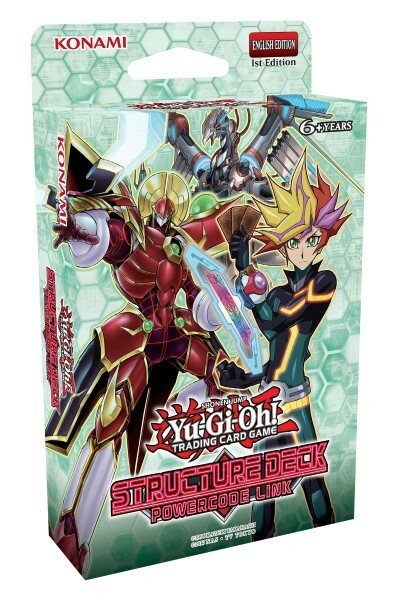 TRADING CARD GAME Structure Deck: Powercode Link is a great second step for Duelists who started Dueling with Yu-Gi-Oh! TRADING CARD GAME Starter Deck: Codebreaker. Co-Link your Transcode Talker from Yu-Gi-Oh! TRADING CARD GAME Starter Deck: Codebreaker with Powercode Talker to boost both monsters by 500 ATK and make them untargetable by opposing card effects! The added protection helps keep Powercode Talker ready to make double-powered attacks every turn. Finally, for Duelists that like to live dangerously, a new Field Spell gives you a chance to Special Summon a random Cyberse-Type Link Monster directly from your Extra Deck without having to Link Summon or use any monsters as Materials. But to claim that reward, you have to take 2000 or more damage from one battle or card effect, simulating Playmaker’s “Storm Access” skill from the animated series!